Pianist Sarah Ouyang will perform the third movement, Rondo Allegro Scherzando, of Ludwig van Beethoven’s Piano Concerto No. 1 in C Major, Op.15. Ms. Ouyang has participated in and won numerous prestigious piano competitions and appeared in major venues throughout the metropolitan area as well as in Italy. 13 year-old pianist Jeffrey Xu has also won numerous competitions, most recently the Gold Prize in both the Young Artist and Concerto divisions of the YPCNJ competition. He will present the first movement of Dmitri Shostakovich’s Concerto in C minor for Piano, Trumpet, and String Orchestra, Op. 35. In 1948, Brazilian composer Heitor Villa-Lobos wrote his Fantasia for saxophone, three horns, and strings, W. 490, a brief work in three movements. The soloist for this piece will be Dr. Paul Cohen, a frequent performer with the PSO. Composer, educator, violinist, and guitarist David Rimelis is a teaching artist for the New Jersey State Council on the Arts and a resident of West Orange. Well known for his informative and entertaining pieces for young audiences, he returns to the PSO with three of his works: Symphony Street, Melody-Harmony-Rhythm, and Jazz is Just a Child of the Blues. 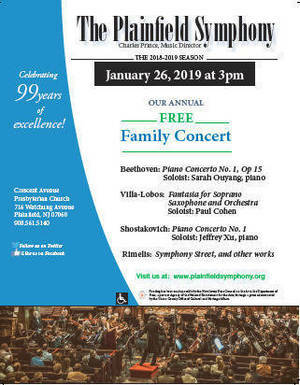 The Plainfield Symphony is New Jersey's oldest community symphony and the third oldest in the country. Season tickets for the 2018-2019 concerts are now on sale and can be purchased on our website, www.plainfieldsymphony.org. Tickets may also be purchased at the concert. For a brochure, please call (908) 561-5140. Subscription concerts are held at the Crescent Avenue Presbyterian Church located at 716 Watchung Avenue, Plainfield and begin at 7:00 pm.